We are probably the same as many hard working families up and down the country. My husband works 12 hour shifts in a call centre and I have forged a career working from home (partly due to the cost of childcare for three children and lack of jobs with school friendly hours). We earn enough money to survive but there never seems to be much money left over at the end of the month. There's always something whether this be new school shoes for the kids, a car MOT or birthdays to pay for and sadly a family holiday abroad for us has had to be put on the back burner for the past three years. 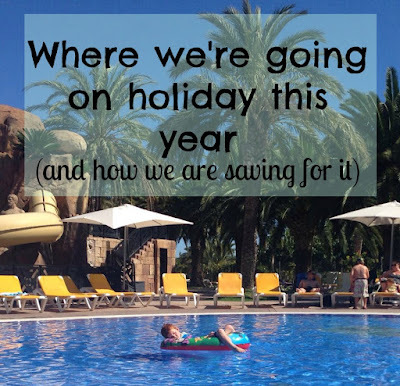 Our last family holiday was in Sanguli back in 2013 and although it is still a budget friendly place to go, the cost of flights is just ridiculous in the summer for 5 people and they all need to be paid up front which is something we aren't in the position to do. We made a pact not to spend any money on each other this Christmas and instead used the amount we'd save towards a deposit. We'd both much rather go on holiday than receive a gift at the moment and we still had other presents to open from other people so didn't even notice. We also saved any money we were given from relatives towards our holiday fund. One of the things I struggle with being self employed is that you don't have one pay day a month. You have 10+ pay days per month and you never know when this is going to be (it all depends when your client pays your invoice). I am very guilty of realising I've been paid and then spending it straight away. Whether this be on something we would like for the house, new clothes for the kids or a meal out. I need to STOP this and stay motivated to save all of my money. 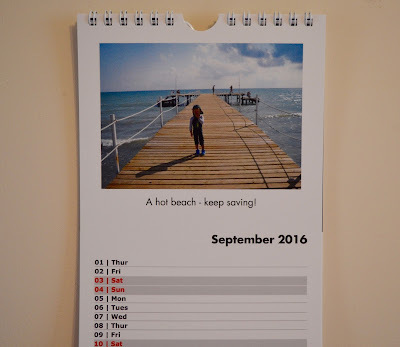 To do this I have created a photo calendar for my office wall with lots of our favourite memories of holidays abroad and the phrase 'KEEP SAVING' on every page. I will look at this every day and hope it will encourage me to save rather than spend. Following on from the above tip, rather than saving up until I have enough to pay the balance of our holiday in one go, as soon as we have any spare money in the bank after our bills have been paid I will be using it to pay off some of the balance. Whether this be £10 or £50 - every little helps! Through meal planning and writing shopping lists we only buy what we need and have ended up cutting down on a lot of food waste. When we shop like this we always have more money left over at the end of the week and you guessed it - it's all going in the holiday fund! Every time I go to the shops now I will write a list and not be tempted to buy anything that isn't on there. I am slightly addicted to planning out our whole year full of trips and usually ensure we have one mini UK break every half term. I am being strict on myself though and not booking anything else until our holiday abroad is paid for. Although I am pretty good at finding bargains, even a low deposit is still a deposit and money that could have been spent on paying off our main holiday balance. Plus, I want my only focus to be on paying off our holiday!!!! Our final balance needs to be paid by the end of April. Fingers crossed we can do it! I need to book a holiday!! The inconsistency of self employment is quite tough, I have a target chalkboard and every piece of income I make gets checked off the total until I smash it, I've been doing this since June last year and I have smashed it every month apart from September but it keeps me focused and makes me work harder. Samantha this is a fabulous blog, although I don't have any kids I've been known to go crazy on the holiday front. This has been really helpful advice! Hope you have a fabulous holiday it really sounds enchanting can't wait to read your blogs after you return or whilst you're on the bus! Ah that's great that you're able to get abroad this year, I'm the same we haven't been abroad since 2012. I'm hoping that we can get abroad this year however, boys have shown interest in going to Rome so I'll probably do a self organised trip to keep costs down. Again I work mainly freelance so it's hard not knowing how much you can save a month...hopefully we get there though :-) Look forward to seeing your holiday pics! There's so much pressure to go abroad isn't there? When actually i asked my 7 year old where he would like to go and he said Scotland. If you can save and do it on a budget that's great, and i'll look forward to finding out how the coach journey went! However, parent's shouldn't feel that a holiday in the uk is somehow a 'comprimise'. Time together having fun can be done anywhere! Enjoy the hols though - looks lovely! Sounds like a great place to visit although the bus journey could be my undoing (I get travel sick). We are hoping to go abroad this year, likely to be camping in France as we live relatively close to the south coast ferry ports. Although I enjoy trips within the UK just as much!